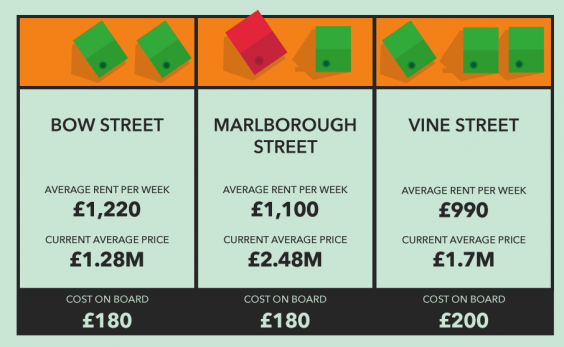 Monopoly Board-what would it look like with todays prices? 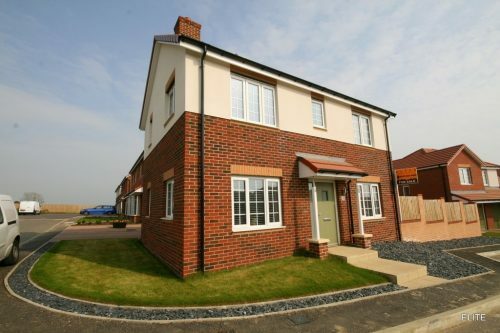 It’s over 80 years since Victor Watson acquired the rights to the UK version of Monopoly, and while many of the place names on the board remain familiar to Londoners, property prices bear increasingly little resemblance to those in the real world. 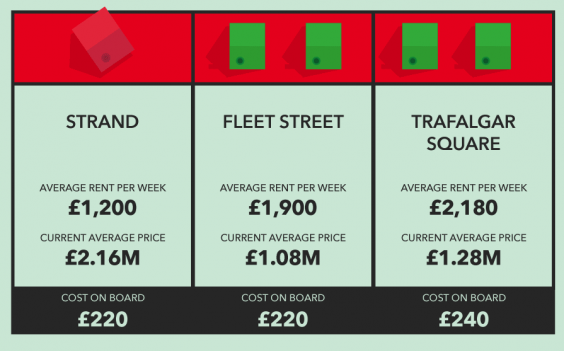 A new infographic from loan provider West One has given the original Monopoly board a makeover to demonstrate the true value of the London locations on the board — all the way from Old Kent Road to Mayfair. 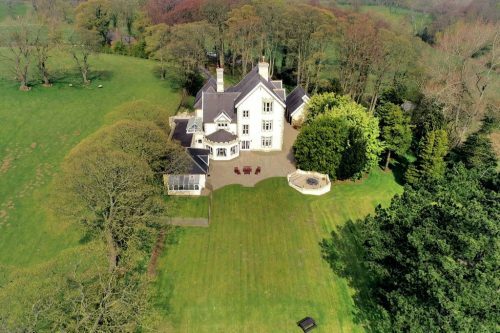 While it won’t be a surprise that these prices are now heavily inflated, it is interesting to note that the areas that are now the most expensive don’t necessarily match up with the most expensive locations on the board. Take a look at the 2017 Monopoly board below. 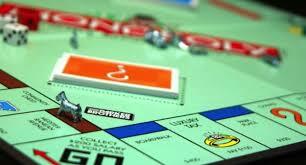 The brown pair of locations are the cheapest on the original Monopoly board. 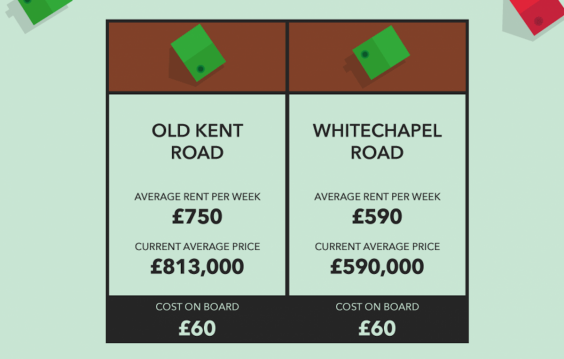 But the average property in Old Kent Road, south east London, now sells for over £800,000 — quite a mark-up from the original £60 rent. 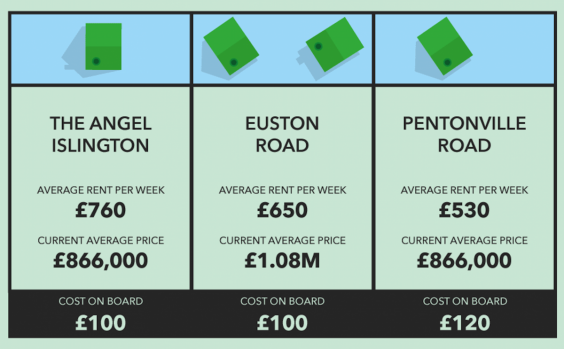 The light blue properties, the second cheapest set on the board, are geographically connected — Pentonville Road runs east from King’s Cross as a continuation of Euston Road, and finishes at the Angel, Islington. 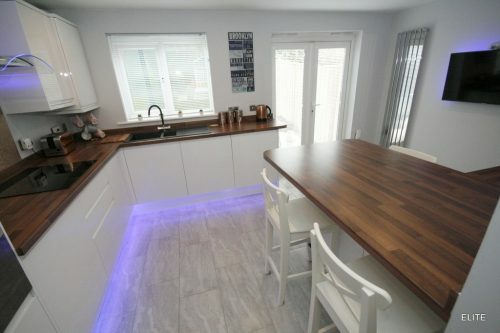 The average property in Euston Road now fetches well over £1 million. The locations on the pink strip are home to some of the most exclusive properties in London. 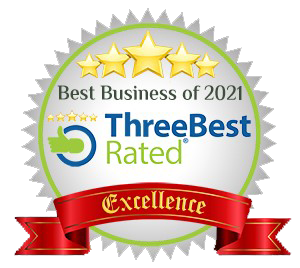 All three areas lie in close proximity to London’s famous Trafalgar Square, in London’s so-called ‘prime’ central property area. The orange set of streets are all located in and around Soho, in the centre of London. They are home to some London landmarks, including Bow Street Magistrates Court and Marlborough Street’s Liberty department store. Interestingly, Vine Street is a small, nondescript cul-de-sac, making it perhaps the most obscure location on the whole board. Trafalgar Square, in Westminster, central London, has long been one of London’s major gathering places, and nearby Strand and Fleet Street are both highly sought-after central locations. Coventry Street connects Leicester Square and Piccadilly, which are all locations in the West End of London. 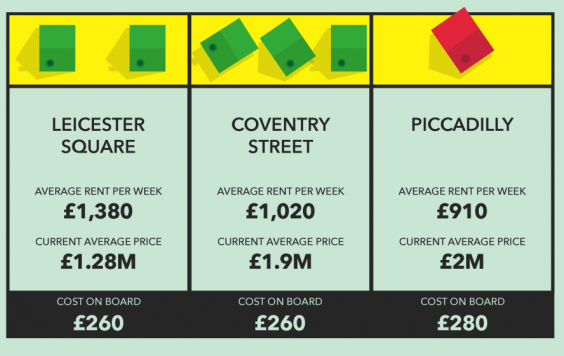 Piccadilly is the most expensive location of the three, with properties selling for an average of £2 million. 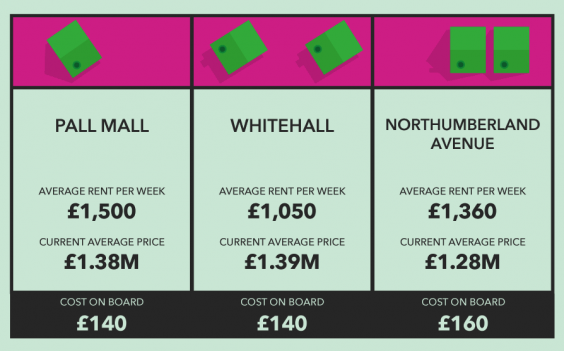 The green strip is home to three of London’s most popular shopping streets. 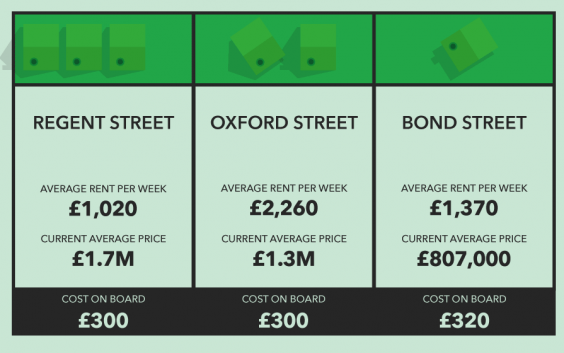 Prices on Bond Street are slightly below Oxford and Regent Street, but all three see properties selling for huge sums. 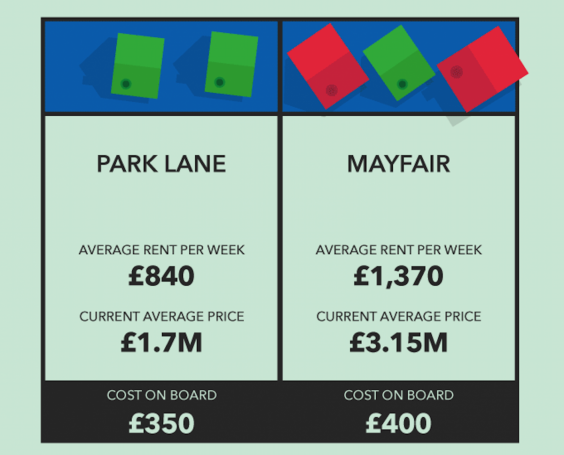 Mayfair is the most expensive property on both the original board and the 2016 board. Park Lane is in Westminster, central London, and Mayfair is located in the capital’s West End, towards the east edge of Hyde Park. 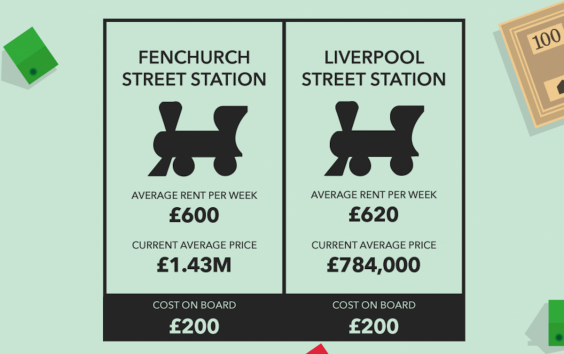 Properties around two of London’s busiest railway stations are also expensive. 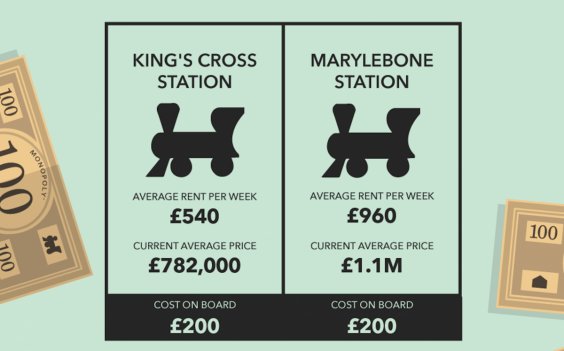 Both stations are major railway terminals in central London. Both Fenchurch Street and Liverpool Street are located in the City of London, the capital’s financial district.